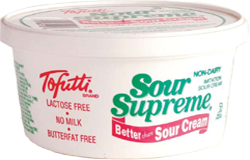 Smart Allergy Friendly Education: Tofutti's Sour Cream - A Topping Which Makes Many Meals Tastier! Tofutti's Sour Cream - A Topping Which Makes Many Meals Tastier! Soups? Desserts? Twice-baked potatoes? Can you imagine some of these delicious foods without sour cream? If you're new to the dairy-free world of cooking, or want a Kosher Parve option, look NO further. Tofutti's Sour Cream NON-DAIRY imitation sour cream, manufactured by Tofutti Brands Inc., 50 Jackson Drive, Cranford, NJ. 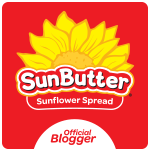 Ingredients include: WATER, PARTIALLY HYDROGENATED SOYBEAN OIL, ISOLATED SOY PROTEIN, MALTODEXTRIN, TOFU, NONDAIRY LACTIC ACID, CELLULOSE, LOCUST BEAN, GUAR, AND CARRAGEENAN GUMS, SUGAR, SALT, VEG, MONO AND DIGLYCERIDES, POTASSIUM SORBATE (ADDED AS A PRESERVATIVE). They also have Guacamole Sour Cream and Non-Hydrogenated Sour Cream. Brooklyn restaurant owner David Mintz was looking for a dairy substitute to use at his kosher restaurant in the 1970's when he found out about tofu. His constant experiments led to the creation of a frozen dessert he called Tofutti. This is just ONE of the Tofutti products this house counts as a household staple. 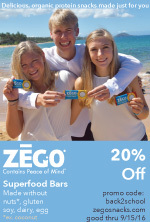 Add the fact that their is NO EGG or NUTS in this product, makes it one of our favorite go to brands! Thanks Mr. Mintz for making such great tasting, dairy-free products! Looking for ice cream sandwiches? Cream cheese? Cheese slices? And the pizza, you must try these out!